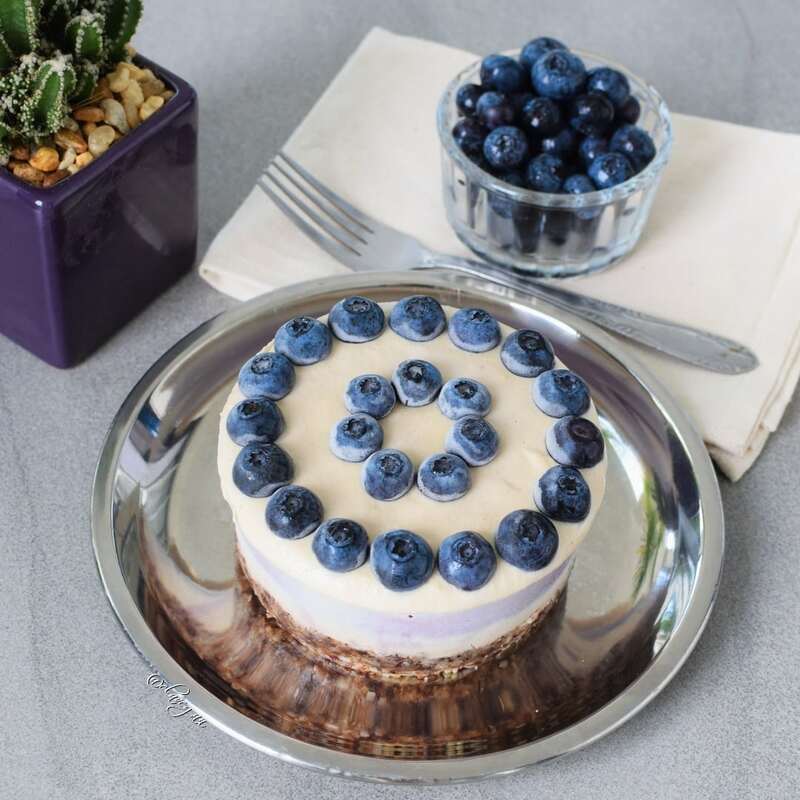 Some people tell me: “Oh you are vegan, so you can’t eat a cheesecake…” Well, of course, I can, I love to make vegan cheesecakes and I love it even more to eat them. The cheesecakes I made so far are not only delicious, but they are also so much healthier than regular cheesecakes which are made with milk, eggs, cream, butter, gluten, sugar and other unhealthy ingredients. What makes my cheesecakes so much better? Well, they contain plants only, no cholesterol and they are cruelty-free and still very tasty. Yes they contain some fat, but that’s healthy fat from nuts/seeds, so don’t worry. Vegan cheesecakes might not taste exactly like regular cheesecakes but I actually like them so much more. Do you like vegan cheesecakes? 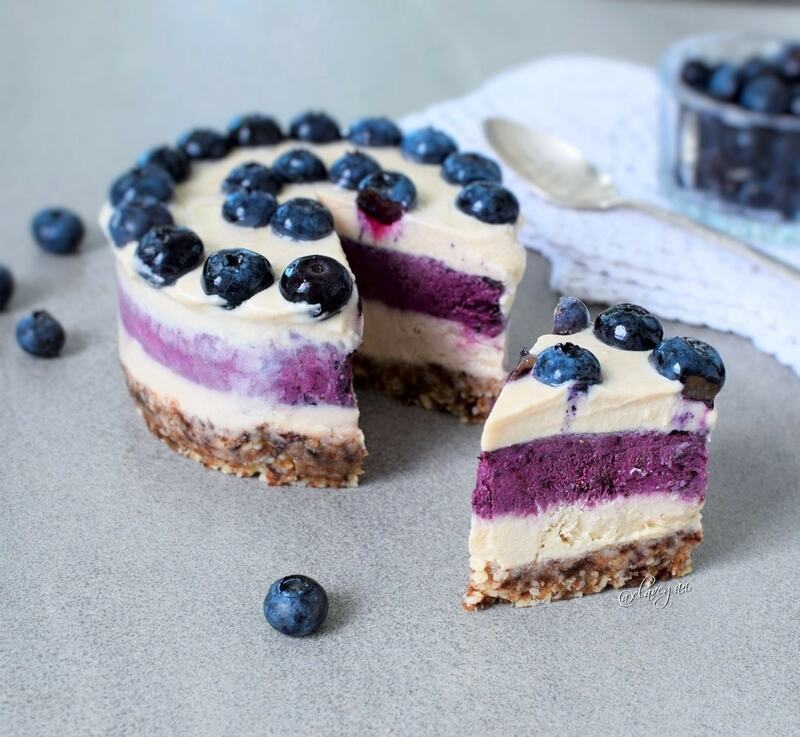 If yes, you will love this raw vegan blueberry cheesecake. This particular cheesecake is not only dairy free, but it’s also paleo friendly, gluten free, plant-based and refined sugar-free. It tastes light and creamy and it will literally melt in your mouth. The cake crust contains two ingredients only, peanuts and dates. But you don’t have to use peanuts, you can use any nuts like cashews or seeds like sunflower seeds or even almonds, it’s up to you. The cheesecake cream contains soaked cashews, coconut yogurt, coconut milk and a liquid sweetener like raw agave or maple syrup. You can use soy yogurt instead of coconut yogurt. The purple layer contains also blueberries, which are not only delicious but also super healthy as they are packed with many nutrients and antioxidants. You can learn more about the health benefits of berries here. I also added a tsp of maqui berry powder and lime juice which turned out into a beautiful purple color. This step is of course optional. 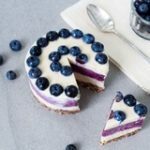 Let me know in case you try out my raw vegan blueberry cheesecake recipe. I am looking forward to hearing if you like it. I used a 4-inch mini springform for this recipe. It’s a very tiny springform. Double the recipe if you have a 5-inch springform. I adore this cake, Ela! It is so cute and love the colors! First time trying a vegan dessert recipe… it was so delicious! I do have a quick question… the purple cream’s texture was almost like sorbet… I’m wondering if I did something wrong? Or is it supposed to have a fairly different texture from the light cream layer? Thank you Ela! Is maqui berry powder easy to find? Maybe at Whole Foods? And is coconut yogurt easy to find? I’ haven’t noticed that before as I browse. Any particular brand? ?im hoping to make this for for the weekend. Look KS delicious! Would this cake melt when left out on the table for about an hour after thawing? Does it have to be returned to the freezer after serving or will it keep its shape on the table till everyone’s done and in the fridge afterwards? Hi- Just wondering if the nuts for the crust should be raw. If not, should the peanuts just be roasted with no salt? Looks delicious! Would it keep in the fridge if there are leftovers or could it be refrozen? Hi – I want to make a 9 inch cake. Can I just double the amount of the ingredients? Is the calorie count for 1/6 of the cheesecake?